Looking to head on vacation to the beautiful Cocoa Beach in Florida? You may want to check out the Hilton Cocoa Beach as an option of where to stay. 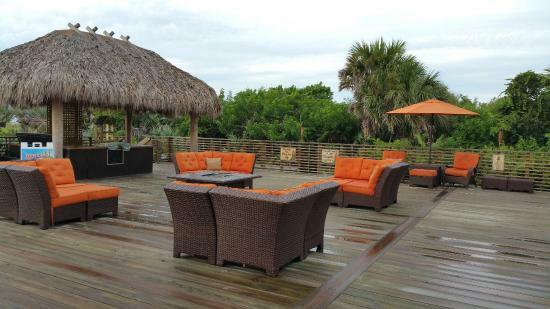 This 4 star hotel sits oceanfront just steps to the wonderful sand beaches that are Cocoa Beach. The Hilton Cocoa Beach is a contemporary hotel that offers a lot of amenities, great service and of course the great location. The Hilton Cocoa Beach Oceanfront is located in the small beach resort community of Cocoa Beach, Florida a few minutes drive from the Jetty Park, the Kennedy Space Center, the Astronaut Hall of Fame, and the Space Coast Museum. Hilton Cocoa Beach recently finished its $15-million renovation giving its accommodations a spacious and contemporary tropical look. Amenities include two queen beds or one king bed that include in-room movies, coffee maker, hairdryer, telephone lines, data ports, and high speed Internet. The oceanfront hotel overlooks the Atlantic surrounded by all the signature touches of a tropical resort which gives guests a relaxed and splendid vacation. The Hilton Cocoa Beach participates in most of the Hilton specials that are running. We also find a lot of Hilton promo codes work at this hotel. You can often save 25% to 30% off through that site. Make sure to always check them out first. Heated Outdoor Pool, Laundry/Valet, Room Service, Restaurant, Iron and ironing board, Coffee maker, High Speed Internet, Radio/Alarm Clock, Hair Dryer, Bathtub, Refrigerator, Movies, 24 Hour Front Desk, Alarm Clock, Baby Sitting, Beach Nearby, Coffee Maker, Express Check Out, Fishing, Free Newspaper, Free Parking, Golf, Handicap Facilities, Meeting Facilities, Modem Jack, Non-Smoking Room, Parking, Safe Deposit Box, Cable TV, VIP Floor. CoolBeans Coffee Bar – serves Starbucks! The Hilton Cocoa Beach has 295 rooms available, all with high speed internet, flat screens and HBO. They also have several suites that you can rent that give you some added space. Perfect if you are traveling with family or perhaps for a business meeting. Astronaut Hall of Fame, Brevard Zoo, Cocoa Beach Pier, Disney World, Historic Cocoa Village, Jetty Park/Fishing Boats, Kennedy Space Center, Patrick Air Force Base, Port Canaveral/Cruise Ships, Ron Jon Surf Shop, Sea World, Sebastian Inlet, Space Coast Baseball Stadium, Universal Studio, Valiant Air Command Museum. From Orlando, FL: Highway 528 East (The Beeline) to A1A. Go South on A1A approximately 7 miles. The resort is on A1A next to the Hilton. 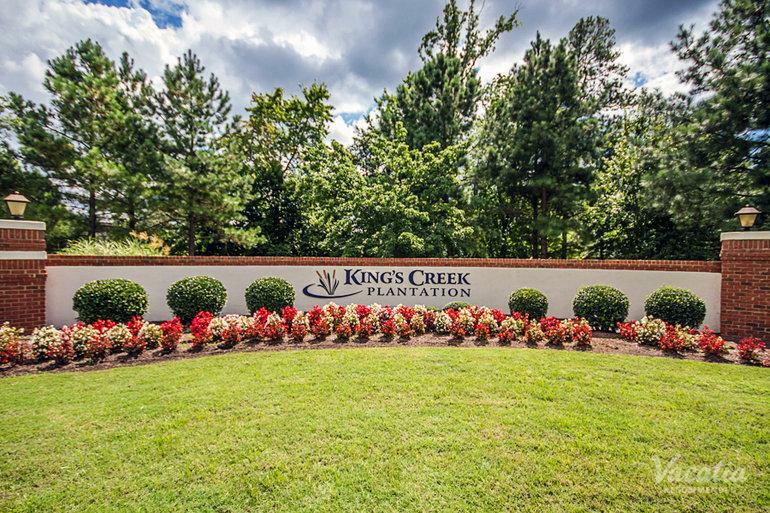 When visiting Williamsburg, the Kings Creek Plantation is definitely a great place to stay! This luxury 4 star resort has many options to choose from cottages, townhouses and even houses to rent. They have an aquatic center, a fitness center, business center and much much more to make your stay an enjoyable one. They may be best known for their junior Olympic sized indoor swimming pool though. Very fun! Considered to be one of the nation’s finest vacation spots, *King’s Creek Plantation* is located in beautiful, historic Williamsburg, Virginia. There are literally hundreds of leisure activities in town. Although the town is best-known for Colonial Williamsburg, the historic restoration in its center, Williamsburg abounds in recreational opportunities: golf, shopping, fine food and entertainment. In addition to the King’s Creek resort’s pool, outdoor spa and tennis courts, nearby Williamsburg has facilities for boating, canoeing, and miniature golf. Within a few miles are Water Country USA (right next door to the resort), Busch Gardens, Colonial Williamsburg, and historic Jamestown and Yorktown. Williamsburg also boasts more than 50 restaurants and numerous public golf courses, bike rental shops, health clubs, shopping centers and theaters. There are many popular destinations nearby. A trip to Colonial Downs, one of the nation’s newest and finest horse racing tracks, is an easy drive. Just a few hours away are other popular excursion destinations: to the south, the famous beaches and fishing of Virginia Beach and Nags Head; and to the north, you will find the historic and cosmopolitan attractions of Richmond and Washington. Master Bedroom Features King Size Bed with Full Bath and Whirlpool Tub; 2 Twin Beds, Two Sofa Beds, Air Conditioning, Carpeting, Fireplace, Full Kitchen with Dishwasher and Microwave, Telephone Service, Washer/Dryer. Handicap Accessible, Meeting Facilities, Game Room, Children’s Playground, Outdoor Pool, Maid Service, Grills, Children’s Activities, Security, Rollaway Bed, Children’s Pool, Whirlpool, Parking, Fitness Facility, Indoor Pool. During your stay, renters at the King’s Creek Plantation can play a round of golf at the award winning Williamsburg National Golf Club for the cost of the golf cart, just $25 a person. Now that a great deal! This special offer is valid for up to a group of four people per reservation. To book your round of golf please contact our concierges during your stay. Busch Gardens, Water Country, Colonial Williamsburg, Kingsmill, Presidents Park, Williamsburg Winery. Take I-95 to Richmond, VA. Then take I-64 East towards Williamsburg/Norfolk/Virginia Beach. Take exit 242B onto Route 199. We are on the right just past Water Country USA. From Virginia Beach, take I-64 West towards Williamsburg/Richmond. Take exit 242B onto Route 199. We are on the right just past Water Country USA. Looking to stay in one of those huts over the water? 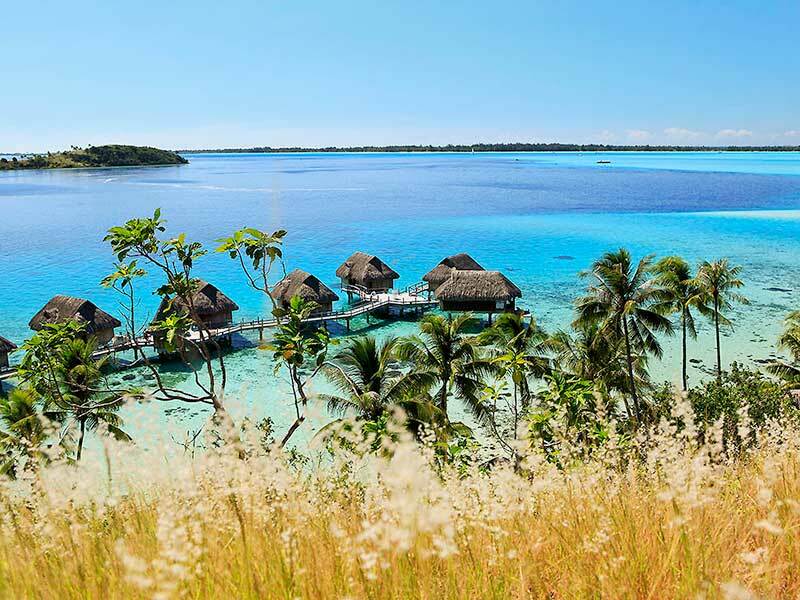 Then you should definitely should be looking at Bora Bora as well as Tahiti. Bora Bora is equally beautiful but a fraction of the cost. 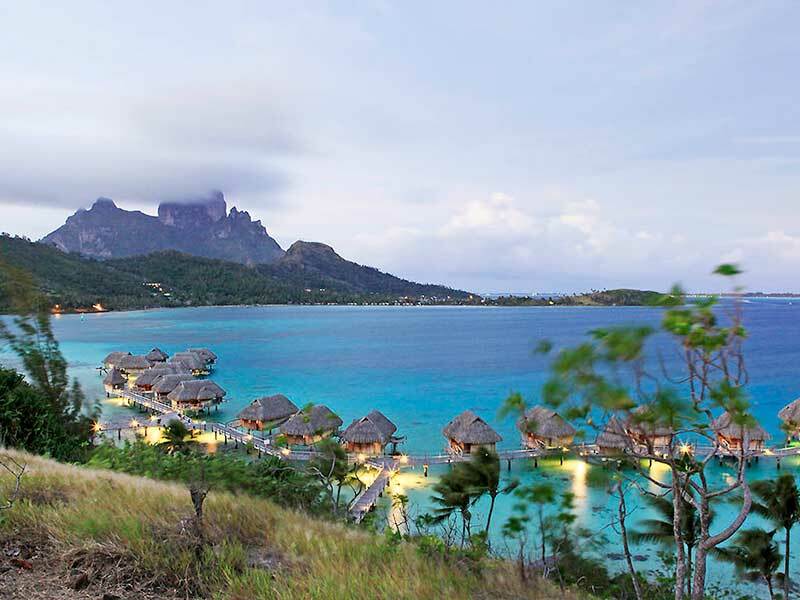 The Sofitel Bora Bora Private Island Resort is one of the few resorts in the area you should check out. The Sofitel Bora Bora Private Island Resort sits in an islet in the Crystal Lagoon of Bora Bora in French Polynesia. Just a short 20 minute cruise from the airport to the mota or island. You will quickly be surrounded by beautiful clear blue water and a view of Mt. Otemanu. The whole experience will truly take your breath away. Bora Bora in my humble opinion should be on everyones bucket list. Words don;t do it justice. 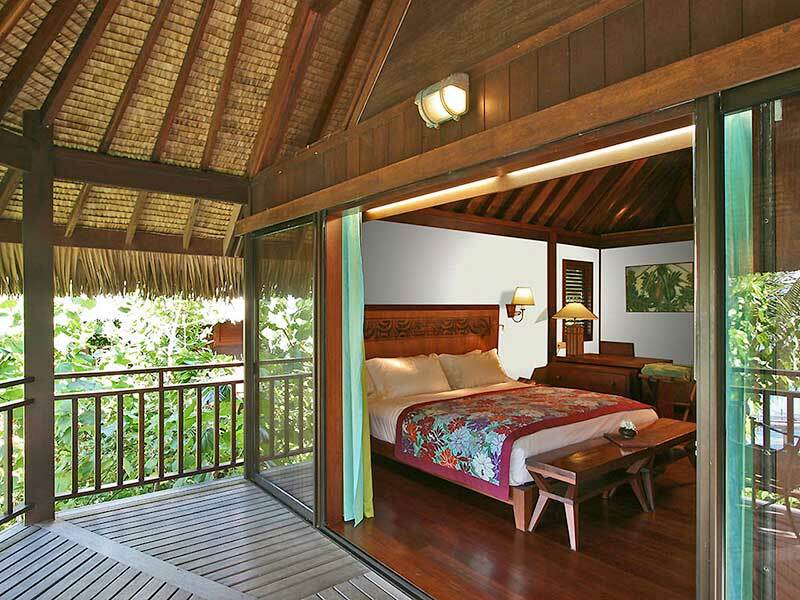 The Resort has a few choices of different Suites & Villas. This five star Sofitel resort is absolutely breathtaking and something everyone should experience at least once. We definitely suggest you snorkel the coral reefs and see all the wonders of the ocean in the crystal blue water. Mt Otemanu is a short 8km from the resort and another tour worth looking into. You definitely won’t regret staying at this beautiful luxurious resort. The service is the best, in the usual french style, and really make your stay extra special. Thinking of traveling to Costa Rica soon and checking out your options for resorts? Than the JW Marriott Guancaste definitely should be on your short list. This beautiful 5 start hotel is truly a luxury oasis in Costa Rica. 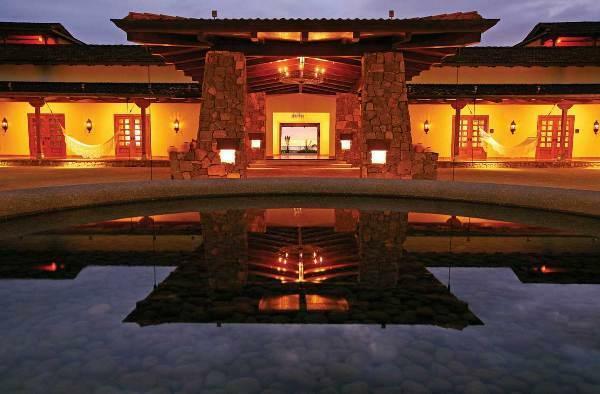 The JW Marriott Guancaste is a hacienda style resort that screams luxury. This ocean front property with a coastal layout has a beautiful 18 hole golf course, a world renowned spa, infinity pool, and many hiking and biking trails. This JW Marriott resort offers 5 restaurants and 2 bars. All the rooms have balconies with either a garden, pool or ocean view. The resort is the only Internationally branded hotel that is near the city of Tamarindo where you can find a lot more restaurants, bars and city life in a laid back atmosphere. * Recommended by the TNT Resorts experts. The hotel is an hour drive from the Liberia Airport. This drive can be a little rough as the roads are the best in Costa Rica sometimes. You will run into this most places you go however. Wi-Fi is offered though out the Hotel & Resort. Their is a daily fee you have to pay to use this service. It is around $15 at the time of this posting which is inline with most resorts. Actually on the lower end. The hotel is kid friendly and has top notch service. You won’t be disappointed in our experience and looking at a lot of other reviews. Check in: 3:00pm and Check out: 12:00pm (pretty standard). This is a non smoking property. Pets are not allowed. Some other cool amenities the hotel & resort has is a barber / beauty shop, Bourbon Program, a game room, babysitting, and even a virtual concierge (have a real one too lol). Of course their are many others, this is just a few that stand out. As we mentioned at the beginning, the JW Marriott Guancaste Resort should definitely make the list of hotels to consider if you are heading to Guancaste. The Resort and the beach are beautiful and the service and amenities are some of the best you’ll find in the area. It deserves the 5 star rating for sure. What really stands out is the food, it is the best in a resort that we have found in the area. 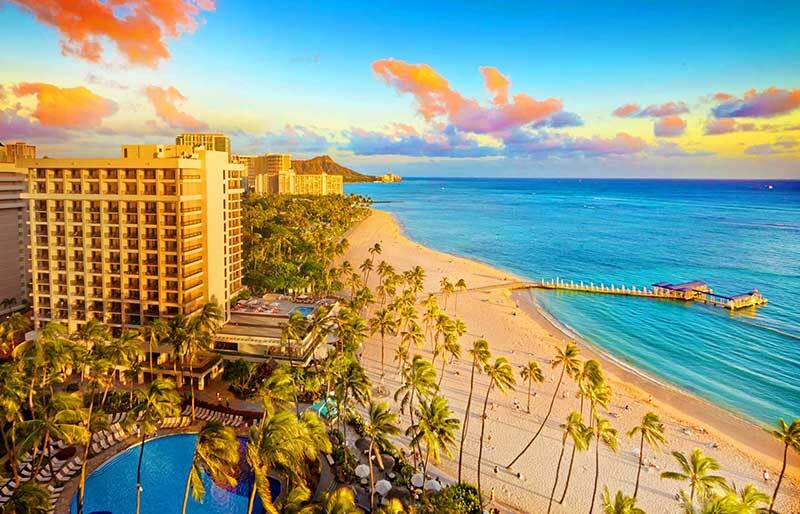 You can’t go wrong by choosing the Hilton Hawaiian Village on Waikiki Beach as your place to stay. It is truly one of the most stunning hotels in Hawaii. The resort, the accommodations, food and the service are all top notch. This beautiful resort sits on 22 acres on the ocean front of Waikiki Beach. This is one of the most popular beach destinations in Hawaii so it’s definitely the place to be! The hotel has 5 different pools on the property including the Superpool which is the largest on the island. They also boast of having the longest waterslide on the island as well. You can find over 20 restaurants & bars on the grounds as well the famous Mandara Spa. Hawaiian & Contemporary Entertainment (music, dance etc..). * Recommended by our experts. Of course there are numerous places at the resort for shopping as well. At least 8 different shops that we counted in the towers and around the resort. The resort also is a beautiful place to have your wedding & reception. They have multiple venues around the property to host your special day. I must say they are breathtaking. Plus what better place to get married than Hawaii! The resort has one numerous awards over the years. Almost all them them are awarding them for being one of the top 10 resorts in the United States. Conde Nast, Travel & Leisure, Parents Magazine and many many more have all awarded the resort. All deserved if I may add! If you are traveling to Hawaii for a romantic get-a-way or even a family vacation that you can’t go wrong staying here. The resort and grounds are beautiful and the service is always great. They really go above and beyond to make your stay a memorable one. This is a major resort though so it is quite large and can be very busy. So if you are looking to be in the thick of things, have a lot of activities to do and be close to things on the island than this is a great place. However if you are wanting to be more secluded and have a quiet retreat than you may want to consider other options.